Biography: The mission statement for Bible Fellowship Church is, to reach the unreached with the Gospel; to build good relationships among the brethren and supporting ourselves." The Omoringamu Village, where the church is located, is a densely populated area where there is marked poverty and illiteracy. Though most people are unemployed, some make a meager living by peasant farming. In the midst of this, Vincent and Alice actively minister to their neighbors in many ways. The focus of the church is to reach the world with the Gospel of Christ, plant churches, reach the needy (both spiritually and physically), bind the broken hearts and bring the homeless home. 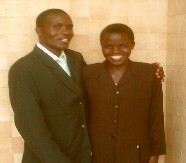 They train faithful men and women who will go out to teach others. They have a very ambitious church schedule, where Sunday services start early in the morning with prayers, then Sunday School classes, followed by the main service. They break for lunch at 12:30 and return for evening service at 3 pm. They also meet mid-week for Bible studies on Wednesday and Friday. The youth of Bible Fellowship Church are trained how to explore their God-given talents by giving them opportunity to lead one full Sunday service. They also conduct evangelistic outreach, where the youth are taken out on visitations praying for the sick and preaching to the unsaved. Strengths: Vincent's strengths are in evangelism and training up the Body to do the Word.